The numbers and needs are disheartening: Thousands of Dane County families are on the brink of homelessness or seeking shelter, thousands more adults and some children in the county lack health insurance and preventive care, many hundreds of struggling school children come from horrendous home settings. Behind each statistic is a real person, a real family, and a real opportunity for the community to intervene and change lives. 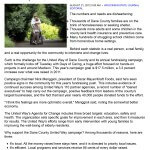 Such is the challenge for the United Way of Dane County and its annual fundraising campaign, which formally kicks off Tuesday with Days of Caring, a huge effort focused on hands-on projects in and around Madison. This year’s campaign goal is $17.5 million.